To those who don’t know, the backronym for Jeep ? Just Empty Every Pocket ? might seem like an insult, but it perfectly describes the lifestyle that surrounds this vehicle. And the good news is that you don’t necessarily need deep pockets to join the club. I’m always looking for an excuse to get together with my lifelong friend and his family, so this spring, we started looking for midway points between Michigan and Georgia that would be easy to access and fun for our wives and kids. Kentucky was already on our radar due to its geographical convenience for both of us, but our plans really moved forward when my wife’s family friends generously offered to let us use their cabin in Burnside. You see, just outside of this sleepy little town is the Daniel Boone National Forest. In high school, my friend and I spent most weekends finding trails in Michigan to ride dirt bikes, ATVs, and anything else with wheels, so we began looking around the cabin for places to go. It didn’t take long to find the Daniel Boone Backcountry Byway. He has a 1997 Jeep Wrangler, which he said he would be willing to trailer down from Michigan if I could find a vehicle to take off-roading. My first e-mail was to Rugged Ridge, located about two hours north of me in Suwanee, Georgia. I’ve done stories on the amazing collection of classic Jeeps before, and I even drove one of their modified JK Wranglers for a few days in California back in 2015. Rugged Ridge was one of the first aftermarket companies to develop parts for the all-new Jeep Wrangler (simply referred to as the JL), so they seemed more than happy to lend me one for this adventure. Starting with an already-capable JL Wrangler Unlimited Rubicon, this rig received a four-inch SuperLift lift with Fox shocks, which was necessary to accommodate the 20-inch Drakon Wheels fitted with 37×12.50 BFGoodrich Mud Terrain KM2 tires. Up front, the Spartacus shorty front bumper housed a 12,500-pound winch. Since the JL is still so new, other parts on this tester were still in the prototype phase, such as the XHD Rock Slider, front and rear floor liners, Eclipse Sun Shade, Hi-Lift Jack mount, and LED third-brake light ring. Now, before I could test any of these parts out on the trail, we had to get to Kentucky first, and that was more than six hours of interstate driving including a jaunt through downtown Atlanta. Earlier this year, I drove a bone-stock $48,000 JL Rubicon, but I was expecting this lifted, modified Jeep Wrangler to be a completely different beast. To my surprise, however, neither the ride comfort nor the steering were affected by the suspension lift and big wheels, and this JL was easy to drive on the 13-plus hours worth of highway driving to get to and from the trails. I credit both Jeep for building an amazing Wrangler and Truck Hero (parent company to Rugged Ridge, SuperLift, and Drakon) for its high-quality components. This Jeep Wrangler ran an unmodified powertrain consisting of the 3.6-liter V-6 (with 285 horsepower and 260 lb-ft of torque) and the eight-speed automatic transmission, and as expected, fuel economy did take a hit dropping from the stock Wrangler’s 23 mpg rating to 18 mpg on the highway. Our Daniel Boone Backcountry Byway adventure started near Slade, Kentucky where our downloaded CartoTracks map laid out an incredible 100-plus-mile loop, although we began the day knowing we weren’t going to be able to run the full trail. What we did get to run ? about a quarter of the full loop ? was an exciting mix of scenic dirt roads, challenging mud trails, and rocky hill climbs; the Rugged Ridge JL Wrangler made easy work of these obstacles. And being the Rubicon, electronic locking differentials and sway bar disconnects are standard. The only thing Jeep doesn’t offer for the Wrangler is a CB radio, but Cobra Electronics sent us its compact 75 WX ST radio for this trip. Stay tuned for a review of that radio. Of course, decking out an already decked-out Jeep Wrangler is a costly proposal. By my estimates, this rig has an as-tested price that had to be pushing $70,000 (this JL Unlimited Rubicon priced out at around $50,000 by itself); in comparison, my friend paid $3,500 for his Jeep and estimates total value at around $8,000 including tires. At the end of the day, we both made it through the same trails. Granted, he did need to use his winch twice and took some hard hits to his axles and skid plates, but his four-cylinder Wrangler equipped with a little more than a winch and 31-inch tires came out the other side in one piece. Seeing the two Jeeps side-by-side really shows how much the Wrangler has grown over the last 20 years. More of the Jeep lifestyle presented itself once we left the trail and headed back to the cabin. There were two gentlemen ? one a combat-wounded veteran ? broken down on the side of the road. Their tow vehicle blew out a brake line, and somehow they managed to not barrel through the nearby intersection or roll into the ditch. As one of the guys checked out the JL, my friend checked out the brake lines and offered up some of the spare parts he carries with him on the trail. After that my buddy trailered his Jeep Wrangler back to Michigan, and we headed south for Georgia. On the way back, we made a slight detour off I-75 to check out the abandoned Nemo Tunnel No. 24 ? and nearby Catoosa Wildlife Management Area ? splashing through about a foot of water driving in a tunnel that dates back to 1878. It was a perfect end to a perfect, family adventure. 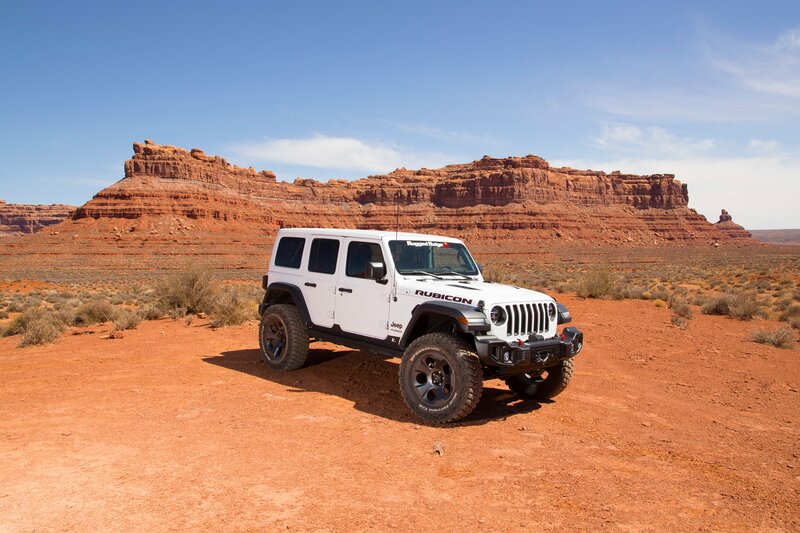 Although we would have had fun in just about any off-road vehicle, this experience was much better in a brand-new Jeep Wrangler that many people hadn’t seen modified yet. In addition to all of the Jeep waves, we got thumbs ups from a variety of other motorists ranging from a guy toting his family in a minivan to an old guy cruising up the interstate in a Chevrolet Colorado ZR2. It’s a Jeep thing, and as it turns out, plenty of people understand! Special thanks to CartoTracks, Cobra Electronics and, of course, Rugged Ridge.